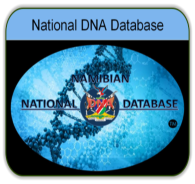 The Introduction of Namibian National Database's project. A large-scale Department of Veterans Affairs project to research how veterans' genes and military service affect their health surpassed 580,000 participants Friday during an enrollment event at American Legion headquarters in downtown Washington, D.C. The Million Veteran Program was designated the largest genomic database in the world when it reached 500,000 participants last August. Project leaders plan to use the information to research conditions such as diabetes, cancer, Gulf War illness, heart disease, kidney disease, schizophrenia, bipolar disorder and post-traumatic stress disorder. But the project could face an uncertain future based on President Donald Trump's proposed 2018 VA budget, veterans with the American Legion said.The budget proposal specifically states that using the Million Veteran Program to advance precision medicine would be a "particular goal" in 2018. But the budget would cut the funding allotted to medical research.The American Legion has testified to lawmakers about their concerns. "We noticed that in the [fiscal] 2018 budget that $18 [million] had been stripped out from [the Information Technology] appropriation for all of VA research," said Joe Plenzler, a spokesman for the American Legion. The total amount in that fund was $20 million, he said. "We are very concerned about the long-term impacts on cutting-edge research projects like the Million Veteran Program. This research is important and will help develop precision therapies that will benefit veterans and the American people in every legislative district," Plenzler said. "We're heading in the wrong direction here. These cuts will limit the amount of research that can be done using the [Million Veteran Program] resource, and that's a mistake." Gerardo Avila and Roscoe Butler, the last two veterans to voluntarily enroll at the Friday event, put the database over the 580,000 mark. VA staff asked them about their medical and military history and collected blood samples. The Million Veteran Program began collecting data in 2011, and it has the goal of reaching 1 million participants by 2020 or 2021, said Sumitra Muralidhar, the program director. "Our ultimate goal was really to be able to provide improved and personalized health care to veterans, and to the population at large eventually," she said. 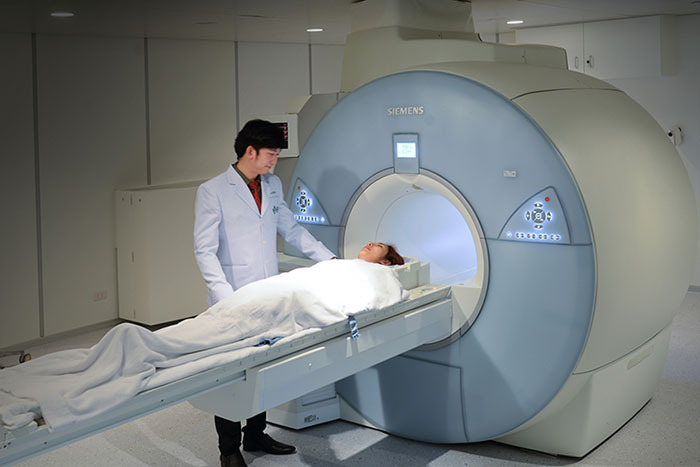 "We're changing the paradigm of medicine. 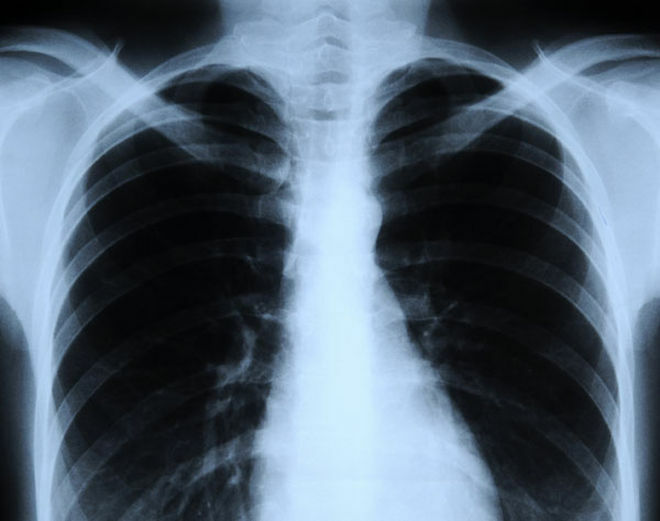 Traditionally, a doctor checks your symptoms and makes a diagnosis based on that. The future is a holistic picture, looking at DNA, the molecular profile of a person and lifestyle." The program was developed with "meager resources," Muralidhar said. "We leveraged what we already had," she said. "We've been very diligent with where we put those resources." The VA sent 4 million invitations to veterans in the mail in order to recruit participants. To participate, veterans can go to one of 65 VA medical centers across the country that are equipped to do enrollments. Veterans must be enrolled in VA health care to be eligible. Muralidhar said she's now working with the Defense Department in an attempt to open enrollment to current servicemembers. Enrolling people earlier could help researchers better track the effects of toxic exposure in the military and improve the likelihood the servicemembers would be helped by the research. Most participants are from the Vietnam War era, in the age range of 60 to 65, Muralidhar said. Less than 2 percent are younger than 30. "We have very few younger veterans," she said. "We're going to follow people who enroll throughout their lifetimes. So if they enroll early, there's a better chance of applying what we learn from this program to them and help them. We can prevent illnesses." Some veterans have expressed privacy concerns with providing their information to the program. Muralidhar insisted the information is kept in a secure system that only a few VA employees are authorized to access. A VA website has a list of locations enrolling veterans into the program. Researchers at the University of Texas at Dallas have developed a wearable diagnostic biosensor that can detect three interconnected, diabetes-related compounds -- cortisol, glucose and interleukin-6 -- in perspired sweat for up to a week without loss of signal integrity. The team envisions that their wearable devices will contain a small transceiver to send data to an application installed on a cellphone. 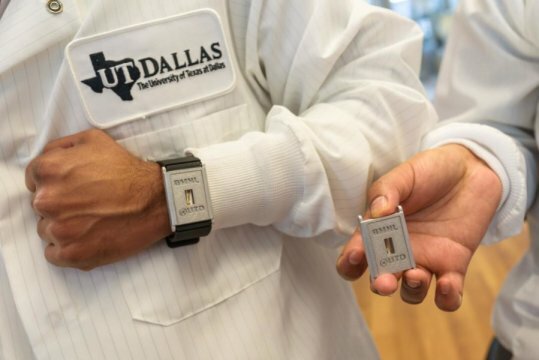 Researchers at The University of Texas at Dallas are getting more out of the sweat they've put into their work on a wearable diagnostic tool that measures three diabetes-related compounds in microscopic amounts of perspiration. In a study published recently in Scientific Reports, Prasad and lead author Dr. Rujute Munje, a recent bioengineering PhD graduate, describe their wearable diagnostic biosensor that can detect three interconnected compounds -- cortisol, glucose and interleukin-6 -- in perspired sweat for up to a week without loss of signal integrity. "This greatly influences the cost model for the device -- you're buying four monitors per month instead of 30; you're looking at a year's supply of only about 50," Prasad said. "The RTIL also allows the detector to interface well with different skin types -- the texture and quality of pediatric skin versus geriatric skin have created difficulties in prior models. The RTIL's ionic characteristics make it somewhat like applying moisturizer to skin." Prasad's team also determined that their biomarker measurements are reliable with a tiny amount of sweat -- just 1 to 3 microliters, much less than the 25 to 50 previously believed necessary. "We've designed this product so that it can be manufactured using standard coating techniques. We made sure we used processes that will allow for mass production without adding cost," Prasad said. "Our cost of manufacturing will be comparable to what it currently takes to make single-use glucose test strips -- as little as 10 to 15 cents. It needs to reach people beyond America and Europe -- and even within first-world nations, we see the link between diabetes and wealth. It can't simply be a small percentage of people who can afford this." Materials provided by University of Texas at Dallas visit the main source for more information. Human Microbiomes: A new study conducted at Harvard University School of Public Health researches shows that the microbial communities we carry inside our bodies and as well outside the bodies which known as the Human Microbiomes have the potential to identify an individuals, much like a fingerprint. Researchers demonstrated that personal microbiomes contain enough distinguishable biological features so unique to construct the outer phenotype of a person. The study, rigorously show that by identifying people using microbiome-recorded database is very feasible in near future. The research surprisingly indicate that those unique microbial inhabitants, could raise potential privacy concerns for any subject directed in human microbiome research projects. 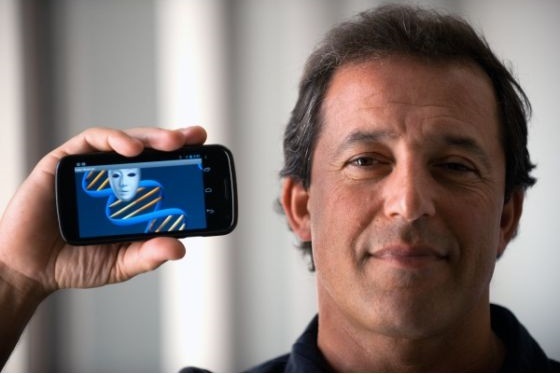 "Linking a human DNA sample to a DNA Database has became a basic for forensic genetics, which is now a decades-old field. 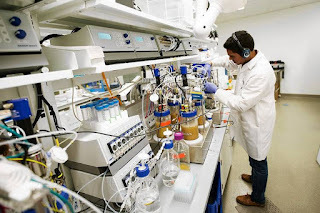 The Bioforensic has moved on, and in this study it shown that the same sort of linking is possible using DNA sequences of microbes that inhabiting inside and outside human body without touching human's DNA. "This technique has opened the door to harvest microbiome's DNA samples and develop special databases, which has the potential to expose the information of the host, for example infections, which are detectable from the microbiome sample itself," said Eric Franzosa, a leading research fellow in the Department of Biostatistics at Harvard Chan. Franzosa. The scientists used publicly available microbiome data produced through the Human Microbiome Project (HMP), which surveyed microbes from the stool, saliva, skin, and other body substances, the samples collected from 242 individuals over a month. 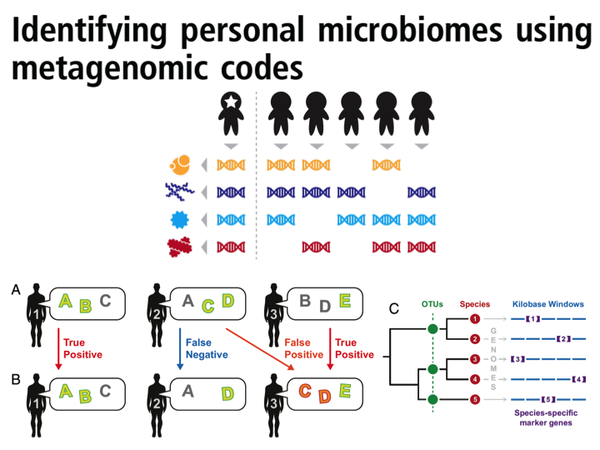 The researchers also adapted a classical computer science algorithm to combine stable and distinguishing sequence features from individuals' initial microbiome samples and place them into individual-specific "codes." They then compared the codes to microbiome samples collected from the same individuals' at follow-up visits. The results showed that the codes were unique among hundreds of individuals, and that a large fraction of individuals' microbial "fingerprints" remained stable over a one-year sampling period. The codes constructed from gut samples were particularly stable, with more than 80% of individuals identifiable up to a year after the sampling period. A biological cell's DNA can recall its primordial history: The biologists and engineers at MIT design new synthetic biology circuits that combine memory and logic. 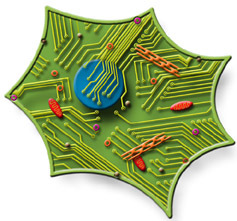 The biological chip allows scientists to program cells to perform some novel functions such as fluorescing in response to a particular chemical or producing drugs in response to disease markers. 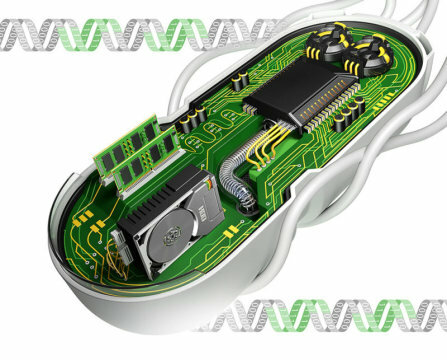 Very soon this new development will prompt the technical revolution from Digital computers to analog computers, a cell circuit can able to translates electrical instructions that naturally written in the cell's genes into a language more intelligible to humans by that human beings and machines "computers" will communicating to each others. The breakthrough in science and biology could help pave the way to highly efficient, highly accurate analog simulations of entire organs. In recent years, analog computers have proven to be much more efficient at simulating biological systems than digital computers. 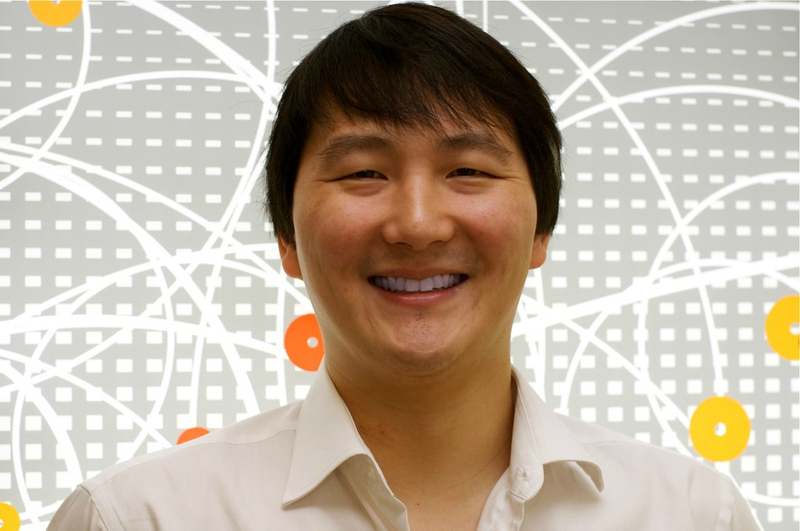 Timothy Lu is Associate Professor of Biological Engineering and Electrical Engineering and Computer Science. He is also the senior author of the new study, which appears in the 22 July issue of Science. In 2013, Lu and other colleagues designed cell circuits that could perform a logic function and then store a memory of the event by encoding it within the cell's DNA. The machine circuits that they designed rely on enzymes called recombinases. When activated by a specific input in the cell, such as a chemical signal, recombinases either delete or invert a particular stretch of DNA, depending on the orientation of two DNA target sequences known as recognition sites. The stretch of DNA between those sites may contain recognition sites for other recombinases that respond to different inputs. Flipping or deleting those sites alters what will happen to the DNA if a second or third recombinase is later activated. Therefore, a cell's history can be determined by sequencing its DNA. Using this special language, the researchers already programmed 60 circuits on span with different functions, and 45 of them worked correctly the first time they were tested. Many of the biological circuits were designed to measure some environmental conditions, such as oxygen level or glucose concentration, and they all respond accordingly. Another circuit was designed to rank three different inputs and then respond based on the priority of each one. Another advantage of this technique is its speed,“It would take years to build these types of circuits" said Voigt. This blog news presented and written by E.A. 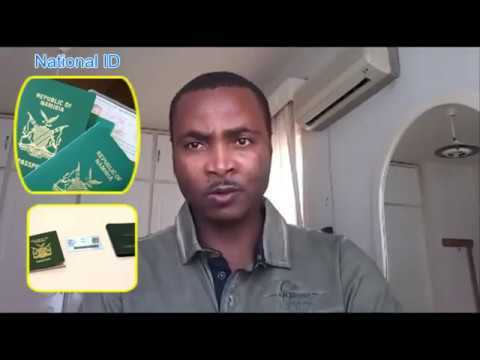 Nambili Samuel whom also is a Bio-medical Engineering student at Cyprus International University,Turkey.